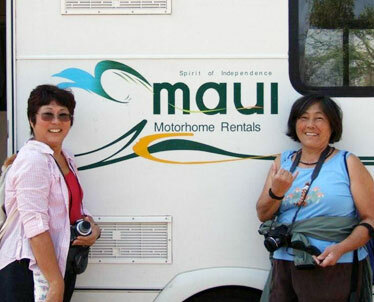 Carol Sakai, left, of Honolulu and Aileen Nitta of Kauai were on a photo safari when they spotted Maui Motorhome Rentals in Victoria Falls, Zimbabwe. Ada Peroutka and her family were in Calgary, Canada, attending a Flames hockey game. 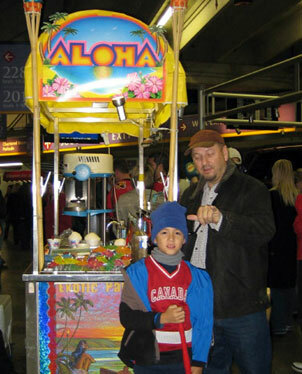 Inside the Saddledome was a shave ice cart, complete with vendors wearing aloha shirts. Peroutka's son, Jeffrey, and husband, Pavel, are in the jackets. 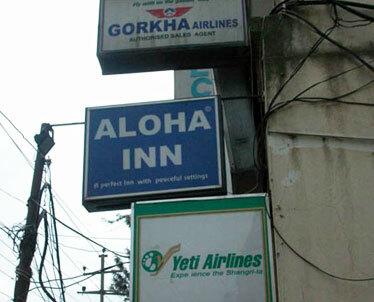 The New Hope Christian Fellowship's Nepal Mission Team was in Katmandu when it came across the Aloha Inn, which boasts it is a perfect inn with peaceful settings.